Each year, UVA’s student-run Arts Board Committee invites an artist to the University of Virginia. This year, in collaboration with the visual studio arts program, the students have invited New York-based artist Ed Woodham, founder and director of Art in Odd Places, a collaborative arts festival. Woodham will give two talks this month on the significance of art in public space, and in the spring he’ll collaborate with students, artists and the community to create an Art in Odd Places festival in Charlottesville. Now, he says, it’s also become about moving art from galleries, museums and theaters to make it more accessible to everyone, regardless of education or interest. There, in those public spaces, he hopes to interrupt the daily lives of passersby, to prod them out of their routine and inspire them to notice something new. 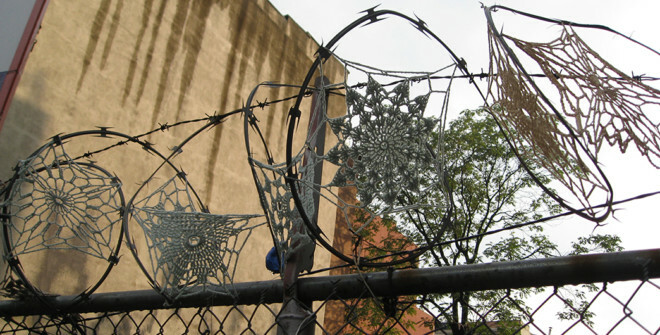 AiOP’s past installations have included crocheted snowflakes by Crystal Gregory inserted between barbed wire on a city street fence, and a performance piece called “White Trash” by Edith Raw, in which she dressed in transparent trash bags full of plastic bottles and other human-made trash. Woodham often contributes performance art to AiOP with whimsical and sometimes elaborate costumes that warrant a double take such as a Sasquatch-like suit or an all-white moving statue costume with a towering headdress. His talks this month, as well as the design and execution of the festival in the spring, offer the opportunity to re-examine our public spaces and experience them through a new creative lens.